In an anthology dedicated to laborers, I expected the stories to reflect the experiences of the working or “blue-collar” class. The title of the book, however, indicates some confusion around its specific focus: “menial” and “skilled” labour are not the same things (menial = servile or “hard” labour, e.g. ditch digger, harvester, etc. ; skilled = trades or trained labor, e.g. mechanic, plumber, etc.). Due to the blurriness around exactly the kind of labour practices and positions are being explored, the anthology is quite uneven. Some of the stories are about working or menial class culture, while others are simply “a day in the life” of people who happen to have jobs. From a purely literary quality standpoint, Menial has a few minor hits and, unfortunately, many misses. While I certainly appreciate the effort of the editors to include a wide-variety of voices in the collection, I think the book would have better served if several stories were either cut or run through a few more drafts. Both Sean Jones’s ‘A Tale of a Fast Horse’ and Dany G. Zuwen’s ‘The Heart of the Union’ could have benefited from another round of revision. With phrases like “her hands, warm as croissants” (Jones), I found myself spending too much time evaluating the writing. Jasmine M. Templet’s ‘Leviathan’ has more untapped potential, I feel, than what I read on the page. I quite enjoyed the image of a large leviathan-like creature in need of reverent washing, but the ending could use greater time to fully develop the horror and awe of the story’s young trainee. Other stories only appeared tangentially related to the theme of menial and/or skilled labour. With its animal-human hybrid protagonist, Andrew C. Releford’s ‘Urban Renewal’ is a bit of misstep for the collection. Sure, Alex has a job, but that doesn’t really seem to be the point of the narrative (and it remains unclear to me). Angeli Primali’s ‘Snowball the Rabbit was Dead’ is a fine enough SF-inflected short story, but, again, it does not really address a theme of menial labour. I think a tighter focus on what kinds of SF narratives work together would have benefited the progression from one story to the next. Those stories that did found common ground with one another end up reiterating familiar work stereotypes. Kevin Bennett’s ‘Belt,’ Clifford Royal John’s ‘Big Steel in the Sky: A Future Feature Article,’ and Sophie Constable’s ‘Air Supply’ basically all say the same thing: work can be dangerous and bosses are jerks. None of the stories, unfortunately, resonated with me in any meaningful or critical way. ‘Far, Far From Land’ by Jude-Marie Green also follows a similar narrative trajectory, but with the old SF trick of transplanting nautical events into space, which I found a bit thin. The attention to character relationships (and their work) doesn’t even out with an apparently startling new environmental change in M. Gilman’s ‘All in a Day’s Work.’ I found Gilman’s story to be engaging in terms of the world-building, but I was left wanting for more of a resolution in the end. After each of these stories, I wondered what was the take-away point. If a writer imagines a future world where workers are the exploited and marginalized peoples of the present day (due to their skin colour, place of birth, or sexual orientation), then I also want some sort of awareness of this unfair division of labour. Otherwise, the writer is in danger of unintentionally recuperating a biased view of what kinds of bodies make the best labouring bodies. For example, “Sarah 87” by Camille Alexa sets out an intriguing concept—the controlled breeding of humans by aliens, using alien-human bodies—but I wish her lead character Jo broke away from the “manly woman who works with men is gay” stereotype. As a scholar who studies the representation of peoples with disabilities in SF, I perhaps have an extra critical eye on A.D. Spencer ‘Carnivores.’ I will always take issue with stories where people with cognitive disabilities are written in as “extra special” humans … and are then overshadowed by some sentient alien fish (the “cherry-noses”). 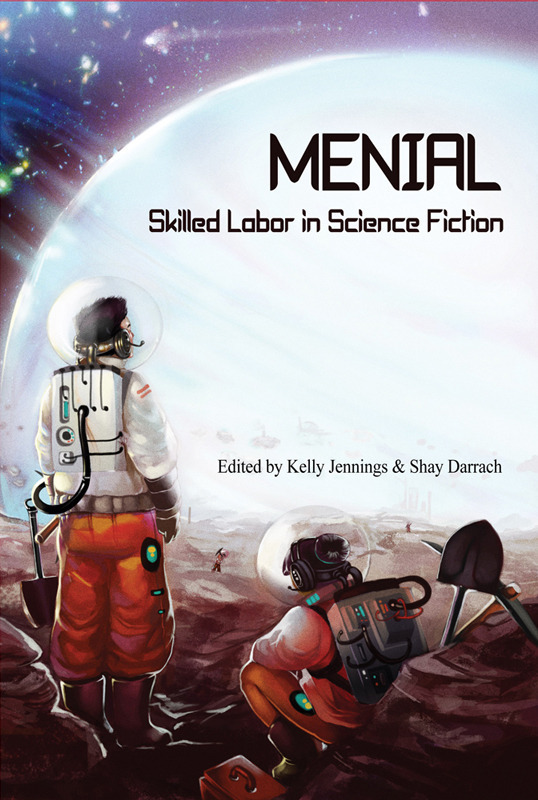 Most of the contributors to Menial do not provide a critical insight into the larger social structures at work in the stories, and Jennings and Darrach, as editors, don’t offer a framework in which to the read the anthology. A short introduction might have helped tie the seemingly disparate pieces of short fiction together. The stories that work best in Menial, then, are those whose visions of either an exploitive or inclusive future feels natural to the tale taking place and the characters inhabiting it. Although a little rough around the edges itself (the structure of the story could use some tweaking), I did enjoy AJ Fitzwater’s ‘Diamond in the Rough.’ About finding lust and love in sewage processing, it was the right pick to start off an anthology aiming to be about menial labour. I also thought M. Bennardo did a good job of conjuring up the sense of isolation that comes with working in the deep Canadian North (present or future) in ‘Thirty-four Dollars.’ While the specifics of Bennardo’s story aren’t entirely memorable, the atmosphere of loneliness has stayed with me. I feel similarly about Matthew Cherry’s ‘Storage’—it is a haunting tale of a quiet clerk and an unknown alien menace. Again, the conclusion is a bit unclear in ‘Storage,’ but the images of the towering dark spaces of the cargo ship linger. There were two other stories that succeeded in capturing my full attention, even though they would not have been my choices to include in the anthology. Barbara Krasnoff’s ‘The Didibug Pin’ is intriguing narrative of exploited labor, medical mystery, and corporate conspiracy (note: I am a sucker for anything vaguely cyberpunk). Unfortunately, it reads more like an introductory chapter to a novel and, as such, I don’t think it works as a short story here. I would be happy to see Krasnoff writing more about Lize’s experiences on and off the harvesting planet. And finally, Menial ends with a beautifully crafted story by Sabrina Vourvoulias: ‘Ember.’ Vourvoulias’ voice is so different from the other stories in the collection that it comes as quite a surprise. Perhaps if there was more variety in the tone and style throughout the anthology in the first place, the change in narrative approach and structure wouldn’t have been so jarring. Overall, I think that Menial is a good start to a conversation about classed labour in science fiction, but more attention needed to be paid to both the coherency of the collection as a whole, and to the craft of writing in many of the stories in particular. I wish Crossed Genres nothing but the best for their future anthologies and I admire their dedication to bringing attention to new writers and themes to SF. With a closer eye to detail and definition, I believe the small press will be able to make a worthwhile mark in the genre market.